Two crowds of brightly colored t-shirts. A budget for parties and field trips. And a secret society to help them land jobs after it is all over. Who said campus politics couldn’t be funny? 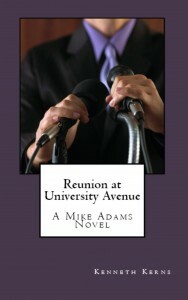 In this fast-paced thriller, interspersed with excerpts of Mike’s novel-within-a-novel (which are in turn loosely based on events at the University of Florida, circa 1999-2002), one truly gets a feel for a world where campus politics is taken far too seriously, where the reputation of a secret society could lead to murder. His debut novel, Reunion at University Avenue delivers an action-packed adventure and a mystery that is tantalizingly near-impossible for the reader to solve on their own. It also sets up a main character and a world that Kenneth Kerns can continue to explore for years to come. Excerpt: Is available upon request. Availability: The mass market paperback edition available on Amazon and the eBook available on Smashwords will expand beyond those initial distributors shortly. The trade paperback edition will be discontinued later in the year. © 2005, 2008, 2013 by Kenneth Kerns. All rights reserved.